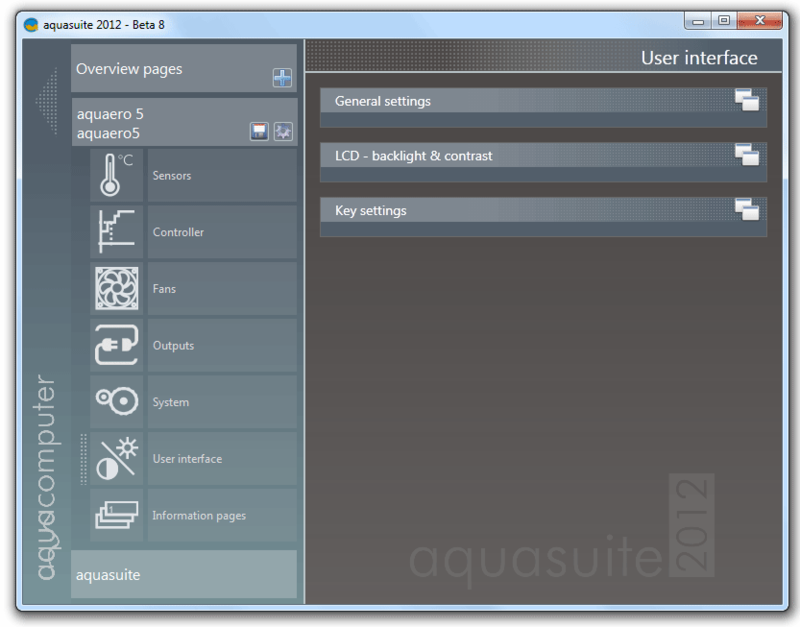 Now lets check the Outputs tab settings in main Aquaero 5 section of Aquasuite 2012. 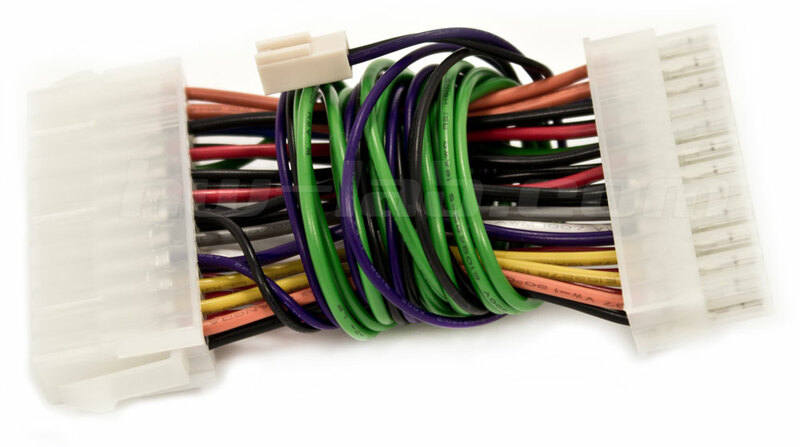 It holds three fields: LED Outputs, Power outputs, Switch outputs & relays. LED outputs as the name suggests, is a set of adjustments for LED modules. The settings allows configuration of color and glow mode in reference with fan operation status (normal or alarm). Moreover, the LED module has its own control mode we mentioned before — “Led controller”. Next is the Power outputs which is dedicated for two additional control channels that use PWM principles to adjust the output voltage. The settings are similar to the ones for fan control channels. These two channels support all four control modes that work with fans. 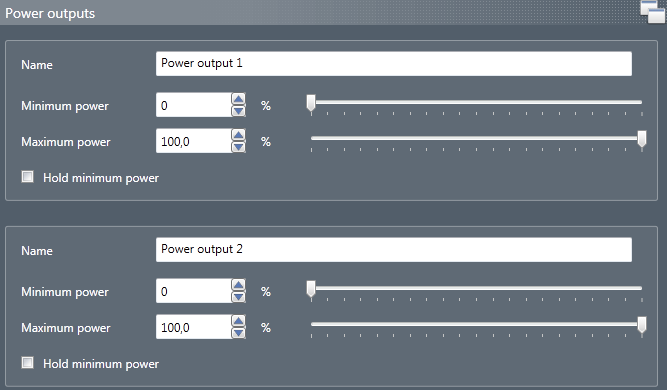 Just to remind you, Power outputs are two-wired and have 1A current limit, PWM frequency — 15kHz. Manufacturer recommends Power outputs to be used with lightning cathodes thus changing its glow more smoothly. Switch outputs Relays — this field represents the operation mode of a build-it relay. Unlike Aquaero 4, the newbie features a three-pin relay. This provides opportunities for not only cutting down the power lane but also switching from one power lane to another. Bare in mind that relay has current limits — 1A at 12V. “Threshold” — operation threshold in % of nominal voltage. The difference between first and the second operation mode is the following: in case “controlled from data source” is selected relay will work depending of user set parameter(for exp, temperature) changes in Aquasuite 2012. If the software is not loaded, the relay is not activated no matter whether it switches on or off. In case “controlled from event system” mode is selected, relay works in references with settings made through front panel therefore does not require nor Aquasuite 2012 not even OS to load in order to execute the set operation algorithm. We have simulated an Alarm situation on our benchtable to find even more obvious difference between these two operation modes. So, in first case (“controlled from data source”), we have selected “Two-point controller” mode and choose relay as control object as well as set the temperature to turn relay on and off. When temperature reaches “turn on at” mark, relay activates and system shuts down immediately. However, when temperature drops below “turn off at” value the relay does not switch back and the system can’t be started. 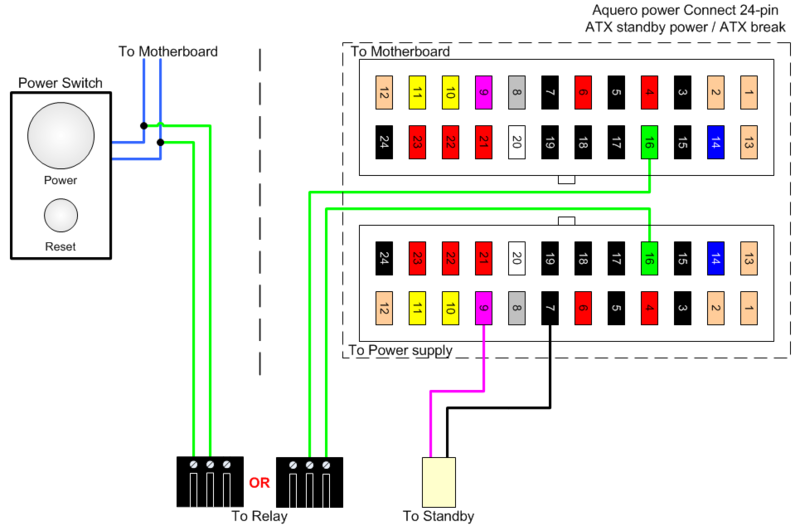 The solution was found accidentally: if you turn off the power of your PC completely (switch off the Power Supply Unit) the relay automatically switches back to its initial state. In case you set relay through front panel you will have a opportunity of switching it for 2 or 10 seconds whereupon it will automatically switches back. 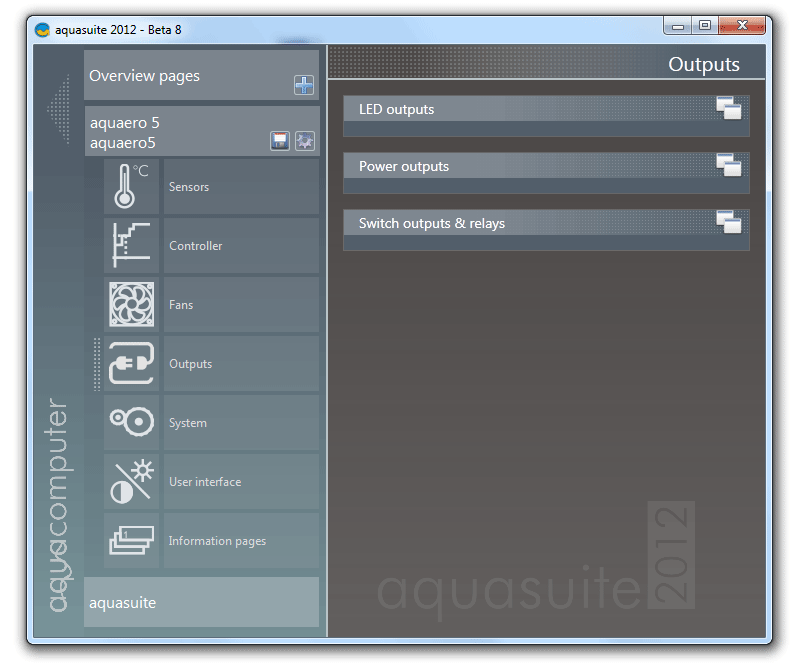 Hopefully we will see more advanced relay settings in the following updates of Aquasuite 2012. Information pages tab settings provide user with opportunities to choose the kind of information and order it is shown on controller display. “Screenshot” makes picture of Aquaero 5 display at current moment. It is saved (“Save” button) in.PNG format. All the variety of information pages is presented in the left column. The right column includes only those that are used by Aquaero 5 at the moment. To remove information page simply click the “X” in the upper right corner of that particular page. To add, just drag-and-drop the desired page from left column to the right one. Each information page can have display duration time set in second from 2 to 600. Or tick “permanent” for constant display of one page only. Common settings section allows change of controller interface language. At the moment you can select either English or German. Black-n-White display has an option of inverting colors by selecting display modes: “Normal (non-inverted)” and “Inverted”. 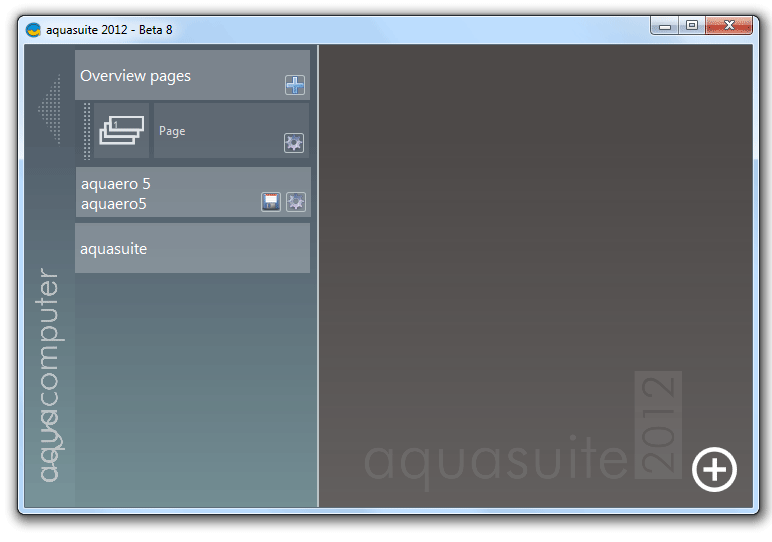 Same as for Aquasuite 2012 you can set display unit for temperature and flow rate shown on LCD. The last group of settings allows duration interval change for information pages displayed on front panel, from 5 to 600 seconds with 1 second step. Next is group of LCD backlight and contrast settings for Normal and Standby modes. No need for commentary, everything is quite simple. Touch buttons settings are quite important for XT versions of Aquaero 5 controller. The sound generated when the buttons are touched can be set to four levels: — “Off”, “Quiet”, “Normal”, “Loud”. You can also change the brightness of four programmable buttons shown on the display itself. In case you stick to Remote Control unit, sensor buttons can be completely disabled. Now we will give you a brief information of setting-up Overview pages. 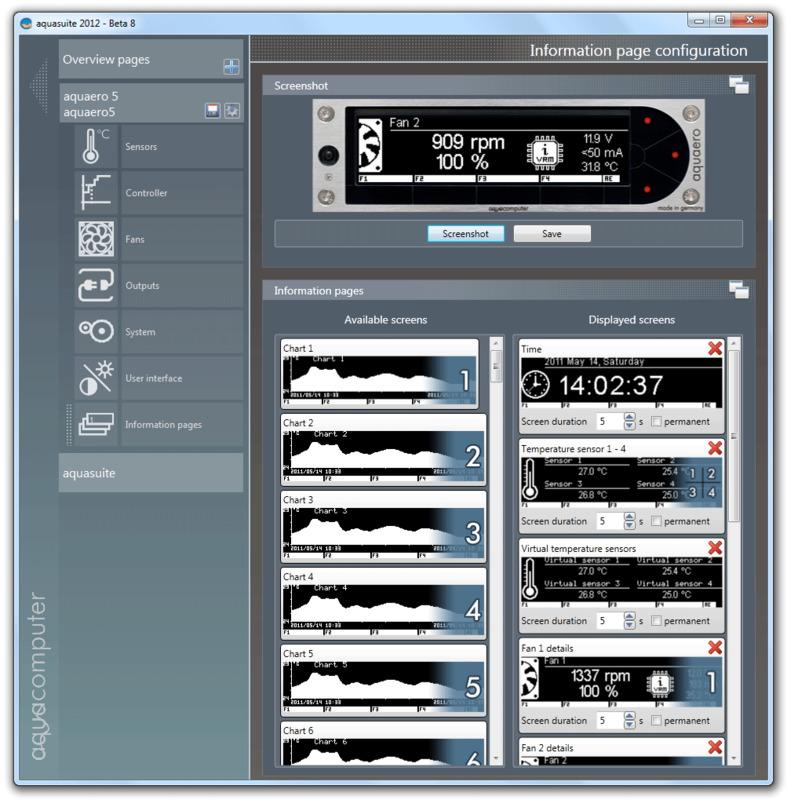 All operation parameter of fans/pumps/etc as well as sensor data can be displayed on a single page for more convenient system monitoring. In the end, you will get graphics form (similar to what modern SCADA systems use) revealing the current status of all the components controlled by controller in real time. Apart for sensors and fans connected to controller, the list also includes built-in sensors as well as virtual sensors. “Custom control” allows user to set the background picture for the overview page. As soon we selected the sensor, “Fan power amplifier 1”, we get the first component for the page plus a tons of settings gathered into five groups. There is no reason to detail each of them, as they are pretty simple to master even for a beginner. We will only note that one overview page can hold more than ten components representing current status of devices connected to Aquaero 5. A bit odd, but neither fans not other devices, except sensors, has the ability to display parameter changes graphically. We believe, it would be helpful for users, especially when selecting control modes and its settings.